According to Hobbyterry, will be releasesoon ! They are also reported to be doing a C133 and a C-5M. The C-133 is due any time. 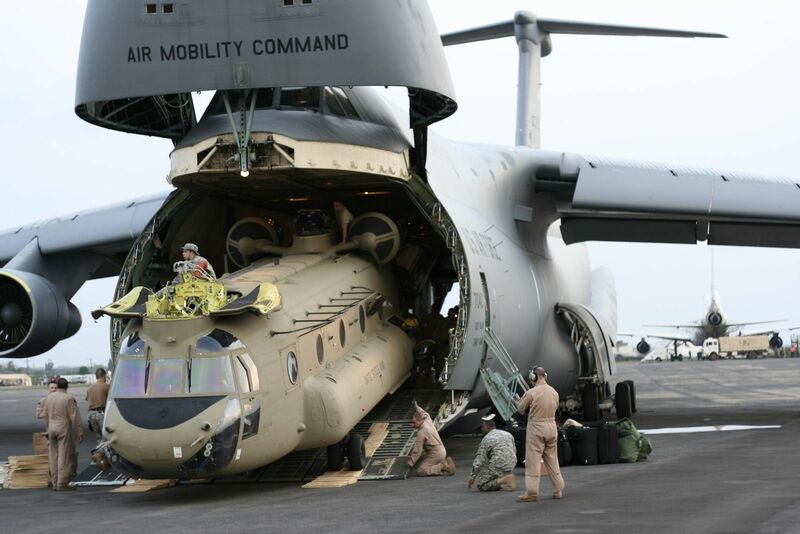 The photo that Hobby Terra has on their site is a C-5M with the new engines. Easy enough to tool both engine types. At long last, the Otaki/Testors C-5 won't be your only choice other than Anigrand! C-133s had such a bad reputation (for falling out of the sky) that the Air Force Security Service in the 1950s and 60s forbade its linguists and analysts from flying on them for any reason. They spent a lot of money training those enlisted troops, and they didn't want to risk them on the 133. My uncle (who was a USAFSS Russian linguist) told me that. Hi, Jennings, hope that you are fine. I agree with what you said about the C-133, but didn't know about the SS restrictions. While at McClellan met the late Mike Dario. He had an interesting story. If you ever saw a C-133 with 'wing tanks' it was a special one, he said. I guess like the ones out of Japan and Germany. Never saw a pic of one, though. Goodness that thing must be HUGE!! Fierce price for an Injection molded kit, I was hoping for an affordable C-5 Kit. i know some guys live it and some hate it... but i think it will come with seperate Flaps, Slats and obviously all other moving flight controls. Where did the photos come from?? at least whats seen so far on these images. I wouldn't mind replacing my 30 years old Otaki kit with a decent tooled Galaxy. All three schemes look awesome, the white/grey, the European One and the modern grey. Cant wait to get this kit! Would love some of the decal makers to make a real nice detailed decal sheet for these! I'm sure Caracals has one at the printer. hopefully a cargo floor is included. Huge and a bit expensive. The perfect X-Mas gift. It's listed at Hannants for 119,99 GBP (= 134,18 �). Aah! You mean 108,- GBP including 10% backorder discount! Wait until United Kingdom is out of the E.U. and you'll save at least VAT. AMS announced for 119,95 �. I fear your nose-up project will include some major surgery on this model. that its not the radar nose cone flipping up but the entire front section below the cockpit. Roden provides a separate radar nose cone, not the open cargo configuration. I totally forgot about Greg's decals! Thanks for reminding me B747FAN! I have been absent for quite a while now, but it should suffice to simply say that I was out on medical leave for the last three years, had three surgeries in January and February of this year, retired last Friday and turned 65 on Saturday. I had a great career, have few (if any) regrets, and consider myself to have been very fortunate. I owe my good fortune to my parents, my beloved Catholic nuns in grade school, and so many other people along the way, and especially to the Man above who gives us everything we have. When you are born, you are dealt a hand and you play your cards the best you can, and I was definitely very fortunate there with the hand I was dealt. Last Friday (August 11th) I called my LHS guy to find out what books he can get on the Ju87 Stuka. After discussing them and deciding on two for him to order, and much to my surprise, he casually said "BTW, your two C-5B kits are here" and I said "You mean the Roden kit?" He replied in the affirmative, to which I said "Are you Sh-----g me!?!? I couldn't believe it! Well, he was not! I do not know how a hobby shop in Louisville, Kentucky can have the kit when HobbyTerra and the others in Europe do not, but it is here in my hot, arthritic, retired hands! It has the GE TF39 engines, so it is a C-5B. Since I believe all differences between the A and the B are internal or otherwise not noticeable, it could be numbered as an A or B as you desire. Most of the upper deck windows are indented, but the lower deck are open with clear inserts. It appears from the instruction sheet that you can build it flaps/slats retracted for an inflight model, or with flaps/slats extended for takeoff as this is how they are often parked. If you are daring, you should be able to remove the locating pins on the ends of the flaps to build them fully extended for a landing configuration also. All of the flight control surfaces are molded as separate pieces. The engines and cowlings are molded to help eliminate the unsightly seams on the intakes, but the fan sections are molded right into the intakes, thus making them hard to paint. Comparing to the Otaki/Entex/Testors/Revell kit, they are pretty close to the same size. Obviously, the Roden kit has more and better detail. The landing gear on the Roden kit is far and away better detailed with more parts and the "U" shape on the main gear for the four wheel rear axle assembly is rounded where the Otaki is more squared, which is wrong. The Otaki kit makes a fine model of the C-5 generally, but the Roden is better in the details. Another minus for the Otaki kit, is that whether it's an Entex, Testors or Revell kit, they were all molded in the same factory of the same plastic, and I have found that when it ages, it becomes very brittle and it shatters easily thus destroying your model beyond repair. I had told my LHS guy that the Roden was coming about six weeks ago and asked him to get me a couple, so when I saw the price of $148.00 each, I was shocked, but I always keep my word and I bought them. I suspect in a few months they will be much cheaper than that, but time will tell. It is a beautiful model and a worthy successor to the 45 year old Otaki kit. PS: I highly recommend the film "Dunkirk" which is now playing everywhere. I rarely go to the movies, but I went to see this one sans wife as she does not like the violence in war pictures, but although it is not one I'll likely see again, it is one I'm glad I have seen. I have long admired the British for their optimism and never give up attitude tempered somewhat by realism, which is well shown in this film. When you see it, you'll know why the desire for books on the Stuka! Enjoy the builds, Jeff...and your retirement! Welcome back Jeff! Sounds like you've had quite an eventful year so far. Congrats on your retirement! Last Friday I stopped in at Mark Twain Hobbies in St. Louis on my way to Kansas City and they also had the Roden C-5B kit for $139.95, so it is available here in the USA now, if a little pricey. I'm sure the price will drop some in the next few months. It appears that Roden may be one of our best hopes of seeing more kits of 1/144 scale airliner/transport aircraft kits in the future, especially of Western types. I'd love to see them do a BAC 1-11-200/400/500 in the near future. $79.95 plus $12.97 postage. The sky really isn't falling. 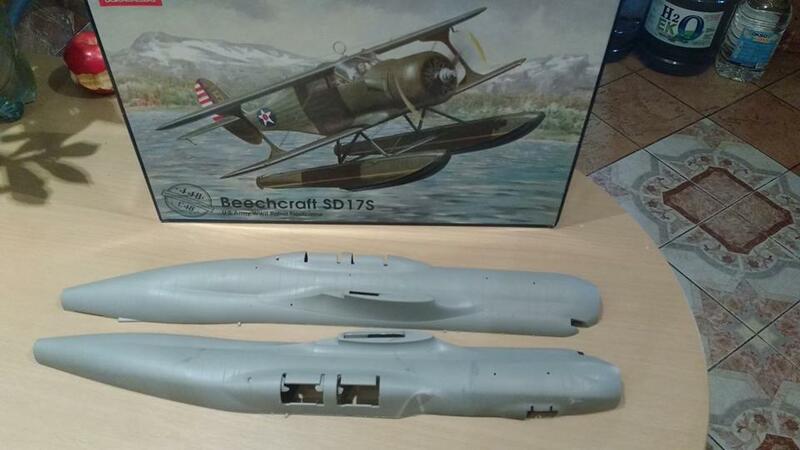 Jeff Jarvis :It appears that Roden may be one of our best hopes of seeing more kits of 1/144 scale airliner/transport aircraft kits in the future, especially of Western types. 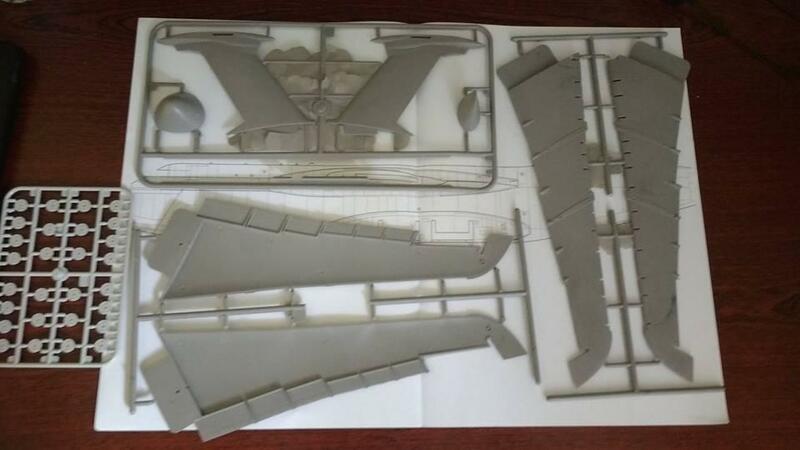 Zvezda and Eastern Express, and Revell seem to be doing a great job with the injection kits, and for resin we have Authentic Airliners. Wow! Looks great, Marco. Very tempting for this airliner geek. Thanks for these detailed images, Marco! Makes decisions easy for me now, its a must have for me given these nice details. I could see it getting a worn European One lizard scheme. Got my C5-B today. Ordered at ebay.de for 95� including shipping. Must be arround 110$. It is a dream of a kit. So much detailed the flaps, the gears, the wheelbay. only fantastic. even the decals look great. I have an unstarted Testors C5-A with resin engines and Draw Decals. the kits are nearly not compareable. The engines from contrails i have modyfied because they were too long. As i got the Roden, i measured out and they have now the exact length of the Rodens. Comparing the decals from Draw and Roden, the look very close. The Draw are a bit darker, the Roden look a bit finer. But what i need ,and this only have the Draw is the window decal. So if anyone is interested in the Testors C-5A incl. Contrails engines, let me hear. I was taken aback too by the sticker price of this model. $130 CAD. For that amount of coin, I would have liked to have seen the model as a C-5M. And a pity that the nose does not swing up. Revell's Ruslan and Atlas are a much better value, kit wise. Nevertheless I look forward to seeing photos of this model in its completed state. They've said they're doing a C-5M later on. 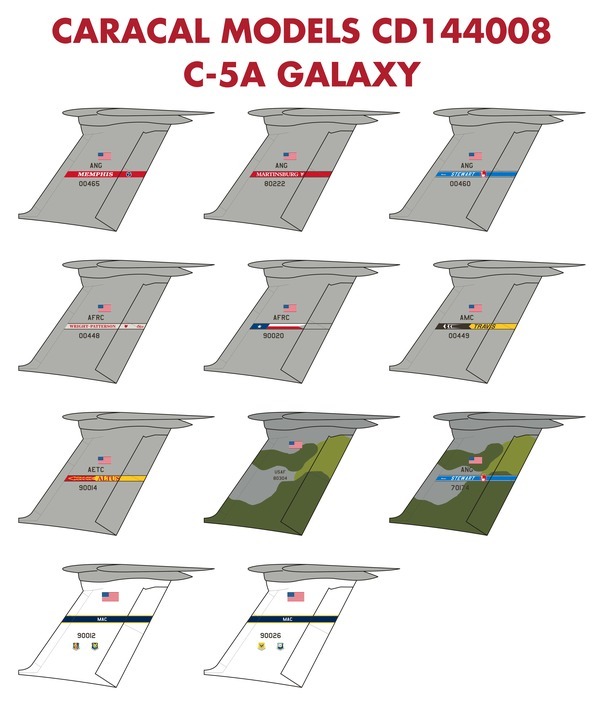 Now that Caracal has separate decal sheets for the C-5 A and B, can someone please confirm that there are no external differences between the A and B version as discussed by Jeff. The engine differences are all internal as well? I was reading that the first batch of 81 A-models suffered substantially from wing fatigue which is why the second and improved batch of 50 B-models received "virtually new-design wings" and 77 A-models were re-winged between 1981 -1987 with the B-model wing. It says from the outside the wings were "essentially similar apart from the moving services". What does that mean? Flaps/slats were different? Correct. Other than the serial number, there is no difference between an A and a B externally. Amazon Germany is selling the Galaxy for EUR 94,70 including free shipping! And the only external difference between the C-5A/B and the C-5M is the engines / pylons. This is quite a model!